For best quality when purchasing fresh blueberries, choose berries that are firm, plump and dry with a dusty blue color. Don’t purchase berries that are shriveled, mushy or showing any signs of mold. 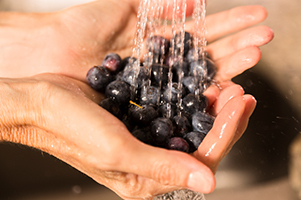 Fresh blueberries can be stored refrigerated up to 10 days and should be washed just before use. Freezing is an excellent way to store blueberries until ready to use. To store blueberries frozen remove from the Texas Pride Blueberries packaging and place in freezer bags as soon as purchased for best quality. Like fresh, frozen blueberries should be washed just before use, but not before putting into freezer bags. Frozen blueberries can be used in all of the same ways as fresh berries.